I have to admit to not having had a desire to make jam before. It requires a lot more fresh fruit than my heart, or my budget, can take. I kinda feel like I'd rather just eat the fruit. Perhaps this has got to do with the fact that I'm not a great fan of jam. We never had it in the house growing up. It's only my boyfriend's love of this breakfast condiment that has me trying and slowly acquiring a taste for it. But with all that said, I'd never had home made jam before. This growing season, Australian farmers had a great yield. But due to all the supermarkets refusing to lower their prices to meet increased supply, they left them as normal and demand remained the same [and many farmers ended up having to throw away perfectly good fruit they couldn't sell]. It's one good reason why I don't get my fruit at the supermarket, instead I prefer to support local fruit shops. My local fruit shop was happy to adjust their prices, and in return we had a summer of budget fruit. They were constantly having sales to move large amounts of stock, but my jaw almost hit the floor when I saw them selling trays of 15 x 250g punnets of strawberries for $8. When I returned two weeks later and found 18 punnets for $5 I almost fainted. A far cry from the $3 a punnet the supermarkets were still selling them for. 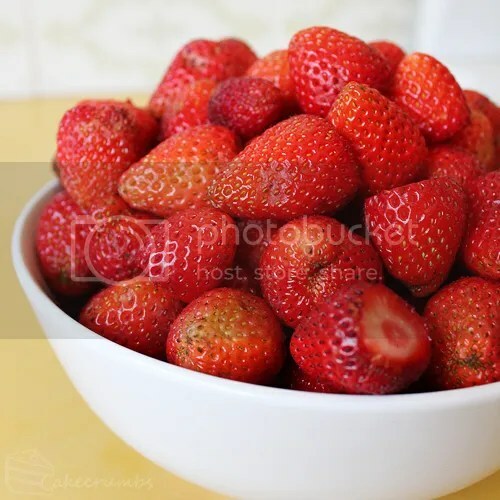 Strawberries are one of my absolute favourite fruits, so I had no qualms using up over 8 kilos of them over the month. 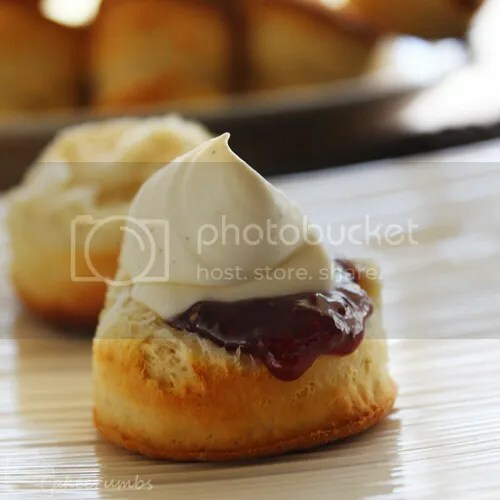 They featured in desserts and on them. We ate them with a fruit platter or with chocolate sauce for a bit of a treat. We had weeks of fresh strawberry smoothies or an occasional thick shake. It also gave me chance to finally see what all this fuss over home made jam was about. By the last week of strawberry haven I was down to 4 punnets that were on the verge of over-ripening. By the time I hulled them and removed a few squishy ones I had a little under a kilo left, so I used a few extra berries I had on hand to make up the weight difference. 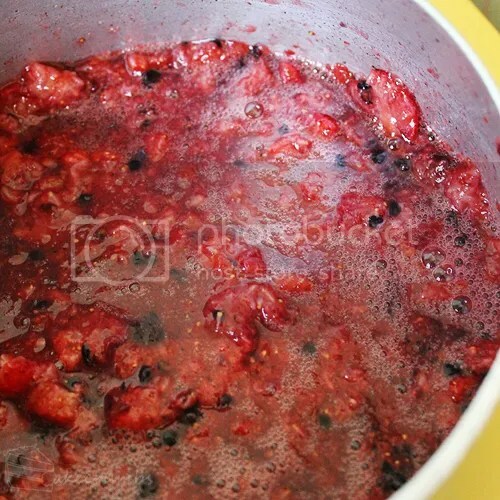 The process of making the jam is endlessly simple. First you mush up the berries – we prefer chunky jam so I left it about half mushed. 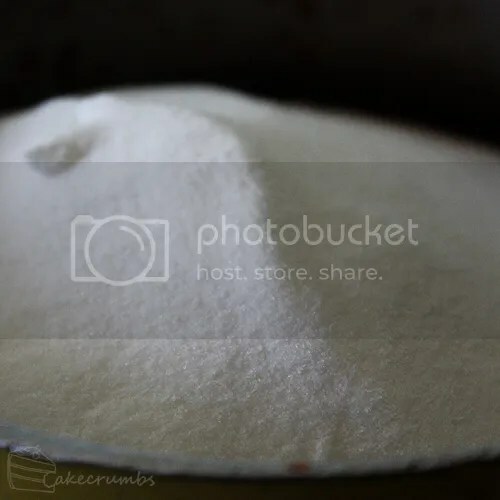 Then you add lemon juice and a mountain of sugar. 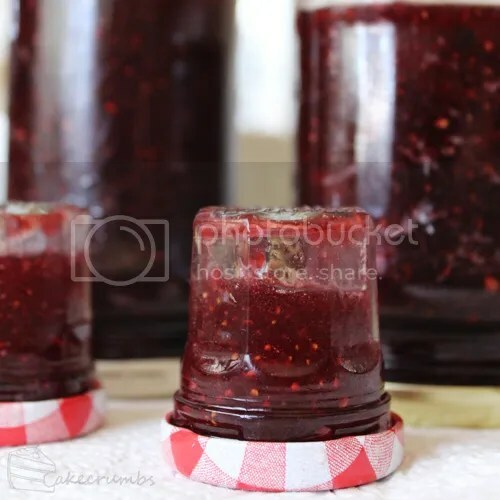 It might appear excessive at first, but for your jam to set properly you need about a ratio of 50:50 berries to sugar, or more if desired. The sugar reacts with the water in the berries to prevent microbial growth, so it acts as both a preservative and as a setting agent. Now, I have to admit to being terrible with recipes and actually forgetting the lemon juice. This recipe has no pectin in it, so the lemon juice makes up for that and is there to improve the set. 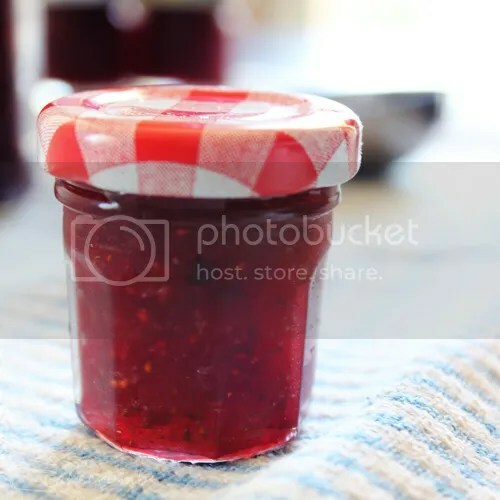 Strawberries have naturally low pectin levels so it's important, but my jam set just fine (we don't really like jam that is too gelatinous anyway). So don't hit panic stations if you forget too, but it's better to put it in. Note that you will want to use a much bigger pot than I did. I had to put the mixture into a large stock pot half way through boiling: once it gets to a rolling boil it really gets going. Once you've brought it to the right temperature, it's time to chuck them in jars. I turned them upside down and left them for 15 minutes. I wasn't processing the jars so this helps to create a seal. Home made jam doesn't last long. All my jars went in my fridge, and some I gave away. I got 3 x 250ml jars and 4 of these mini jars out of it. There was no real purpose to the mini jars. They're just so cute. You can buy jam jars from most home, craft or hobby stores. Me, I hold onto any interesting-looking jars so it gave me the opportunity to use some I'd been holding on to. 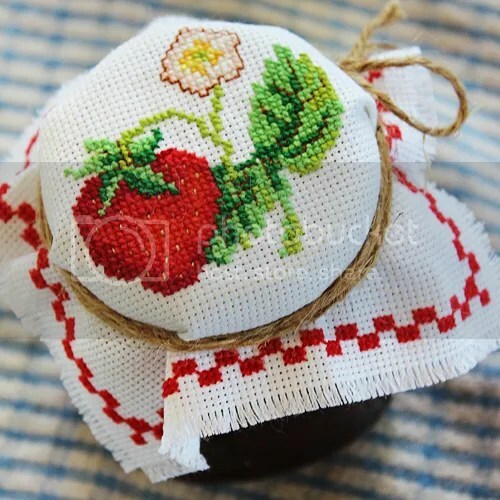 Because a lot of my recycled jars have brand names on the top, I whipped up an embroidered jam jar cover to put on the top. My inner-Nanna was well and truly out and dancing on this escapade. 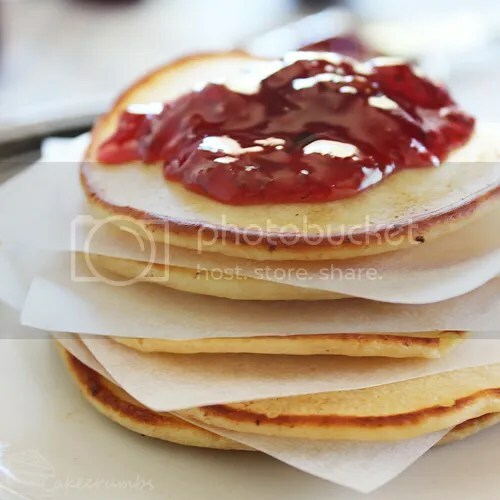 … to piles of pikelets. Sterilise enough jars for about 1 litre of mixture. Be careful not to touch the inside of the jars or the inside of lid to prevent mould. 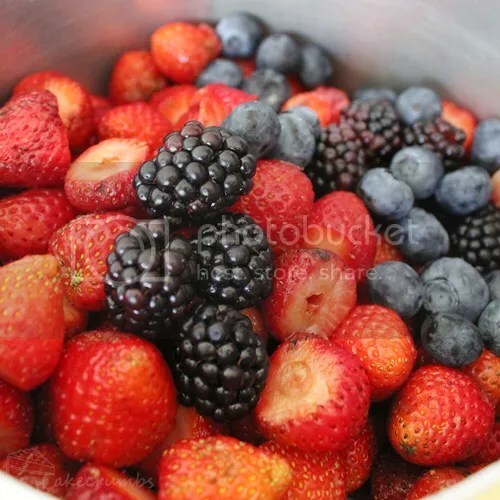 Place hulled berries in a large pot and crush with a potato masher. Add sugar and lemon juice; stir over low heat until sugar dissolves. Bring the mixture to a rolling boil over high heat. Boil, stirring often, until it reaches 105°C (ensure your thermometer is not touching the base of the pan when you take this measurement. It will take some time for the mixture to tick over from 100­°C to 105°C, so be patient with it). Transfer mixture to jars and seal immediately. 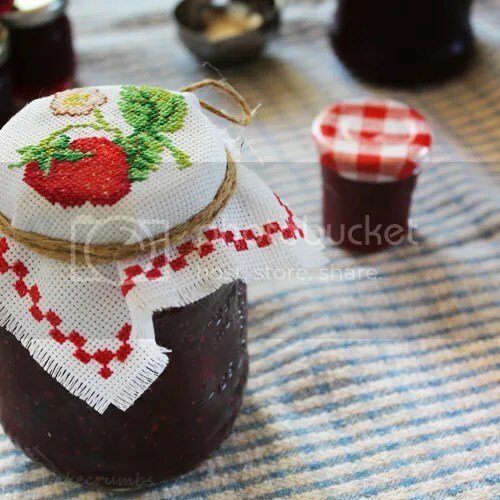 If the jam is intended for long-term storage outside of the fridge or to be given as a gift, process the sealed jars. Alternatively, if jam is intended for consumption, store jars in the fridge. Loved this jam! And your embroidery looks great too. 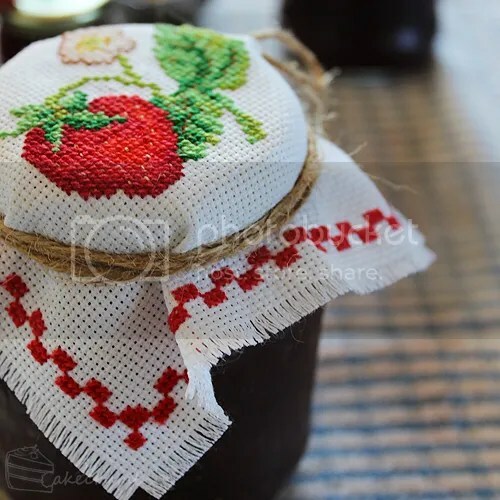 Hopefully there’s some more cheap jam next summer – for our sake, not so much for the farmers.